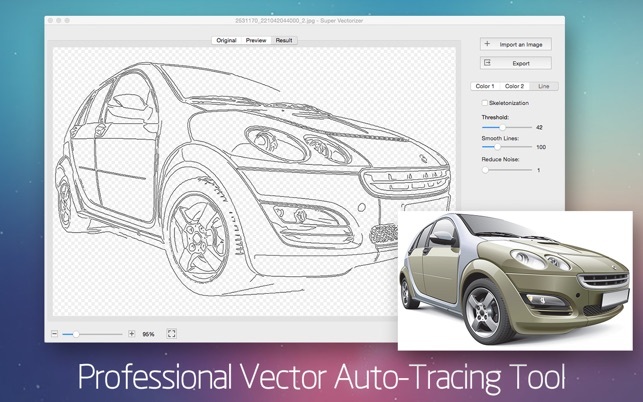 Super Vectorizer 2 is a professional vector tracing software that automatically converts bitmap images like JPEG, GIF and PNG to clean, scalable vector graphic of Ai, SVG, DXF and PDF. It supports tracing of color and grayscale, black-and-white, skeletonization and line as well. Super Vectorizer 2 uses a totally-new image quantization algorithm that produces more natural color after vectorization. 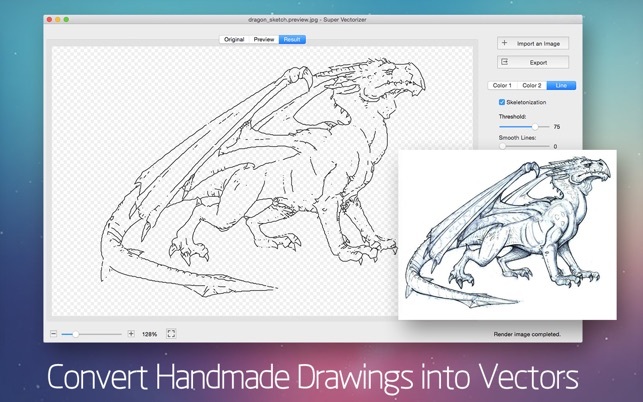 The output vector art works seamlessly with Illustrator, Corel, and others. • Supports up to 64 colors now. 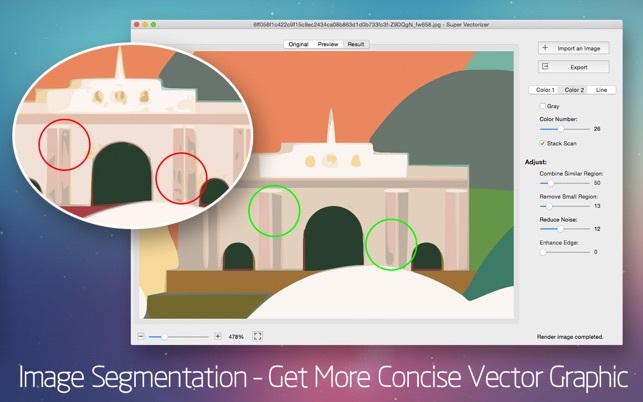 • Segmentation editing capabilities: Trace more clean line borders that greatly simplifies the information to get more concise vector graphic for the ease of editing. It succesfully avoids a region overlapping. • There are two color modes now. A new color mode with image segmentation polymerization algorithm was unique in the AppStore at present. 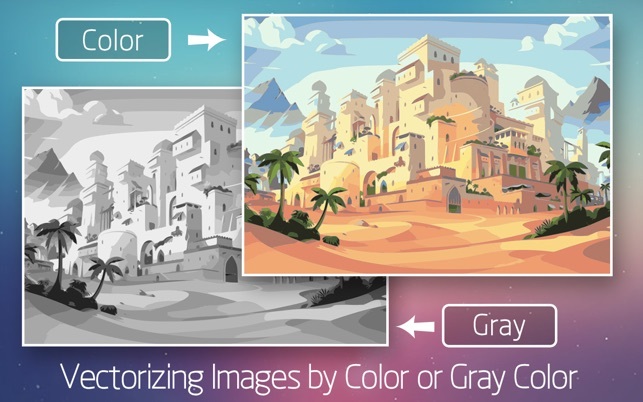 • Options for vectorizing images by Edge or Color or Gray Color. • Options for vectorizing images by Skeletonization or Line. • Better Optimization of line-tracing with a new line-tracing engine : accord more closely with users’ needs. • The function of skeletonization will enable conversion from pencil drawing into vector graphic easily. • The enhanced pre-processing smoothing function simplify the complex image very well. The smoothing algorithm is four times better than that of Super Vectorizer. • Better Accuracy: more closely resemble to the input image. • Ai, SVG, DXF and PDF vector graphic output. • Optimized the operation for convenience zooming in and out to check the processing results. 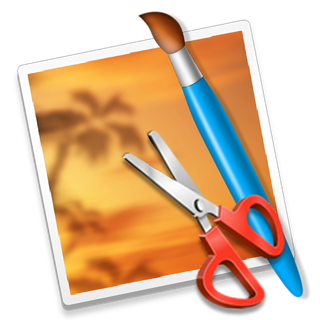 • Supported opening files by dragging and dropping it to the icon for easy operation. • Powerful preview to inspect the result in detail. • Vectorize very large images. Super Vectorizer 2 is used for personal and professional projects alike, whether you are a hobbyist or a graphic design company. 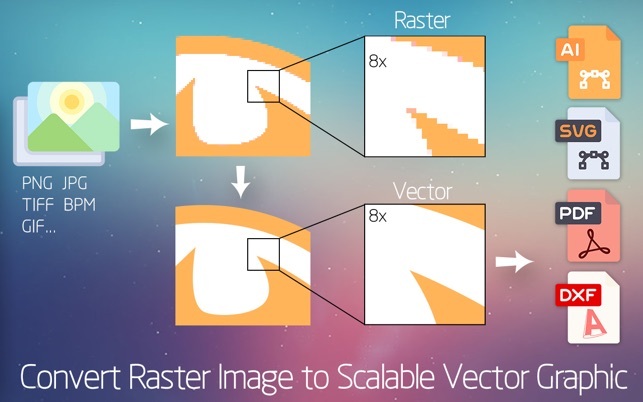 With Technological Advances in raster to vector conversion, Super Vectorizer 2 does an impressive job of vectorizing Raster / Bitmap photos or Images into crisp, clean, scalable fine Line Art / Illustrations / Vector Graphics. It will assist anyone who does lots of vector image cleanup in becoming more productive and efficient. Save huge time and money to speed up your workload and get your artwork ready to print, embroider, cut and more! 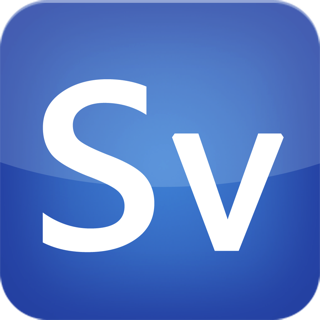 * Freebie: Users who buy "Super Vectorizer 2" TODAY will get a free license of "Photo Size Optimizer" (Original $29.99) which is powerful photo resizer and optimizer. The gift is only valid for the TODAY's purchase of "Super Vectorizer 2". Email market@effectmatrix.com for the license with your purchasing record, date included. * Optimized for macOS Sierra. * App has been localized to Japanese, Spanish, French, German, Italian, Russian, Simplified Chinese, Traditional Chinese. This is a very focused tool. It does one thing. It does it well. I've been using it for well over a year. It's never crashed on me. Lately I've been using it to convert low resolution black and white illustrations to svg so that I could scale them up cleanly. One user reviewer commented about it not recognizing fonts. In my opinion that's a really advanced functionality that goes far beyond vectorizing a raster image. This app is just about taking your pixels and converting them to bezier curves and it does a good job. It will not be a perfect conversion because that's just not a realistic thing to expect, especially when dealing with gradients and complex coloring. It's just the nature of vector images. That being said, in some simple black and white cases it's worked so well I can't tell the difference. Version 1 was good. Version 2 is better. The only thing i wish was different about it was that the slider for number of colors let me either manually enter a number or had something i could click to make it go up or down by one. Sometimes it's difficult to drag just one number lower / higher. I would note that the edge detection mode works well but is almost never what I want. If you want to convert an image to a vector and have it look roughly the same, you want color mode. Also, don't forget to click the checkbox if you're working with a grayscale image. Works Very Well! Incredibility well! Just finished testing this out with some artworks I had done on my computer and it works incredibility well. It does what it says it will. I suggest getting it now if you think you might need it in the present or future. I have seen many vector apps but none as good as this one. I have imported the Old Victorian Scanned- Badly scanned images of 1990’s and Viola…Its DONE surprisingly accurate and unbelievable. Its Simple. Thanks for making it simple. I will sure recommend this app. Please make this same functioning app in iPad. and let me know I will buy in Premium price. If we select region and than each region( Magic wand or square, round, freehand selection) can be layer or different svg file than it would be great update. Thanks to all and God Bless your team. Keep updating. This tool has given me a lot to work with. I wanted to take a picture of my jeep with my dog and myself. I used the picture to create a vector drawing I could edit to simplify and remove the background. Next I can then create an output to a cnc plasma cutter to cut the outline on a piece of steel. Then I place a place a printed output on the steel and follow the pattern with a bead roller. This will be then painted and used as a sign for my shop. In summary, I could never have performed this task without this software. Great stuff. Thank you for your review. We're glad that Super Vectorizer can help you do this honorable job.